Many households with children use art as a great way to pass time – it’s a creative outlet honing essential skills, and a way of giving a parents a break. 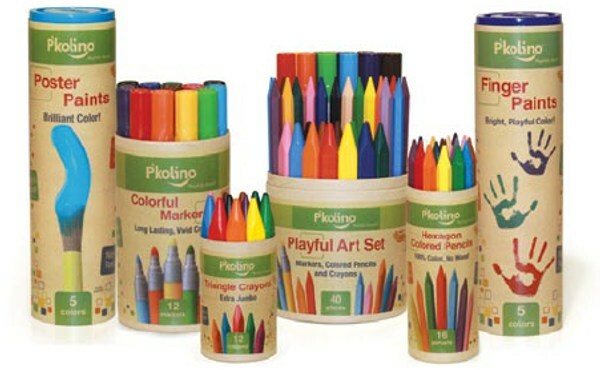 P’kolino, whose products we have featured many times before, has ventured into the art supplies market, collaborating with world renowned manufacturer Jovi to offer a beautifully-presented range for young children. Included in the collection are: colourful markers, finger and poster paints, hexagon coloured pencils, triangular crayons and pencils, and an all-in-one art set. The shaped pencils and crayons are perfect for those little fingers to practice a good hold on writing implements. Prices start at US$5.99 and go up to $19.99 for the art set, from P’kolino.